Os grid reference: SJ 0292 7107. Some 2 miles to the south-west of St Asaph and hidden-away in a wooded area near Cefn Meiriadog – stands St Mary’s Well (Ffynnon Fair) and its associated chapel (now in ruins), once a much-visited Roman Catholic pilgrimage centre. 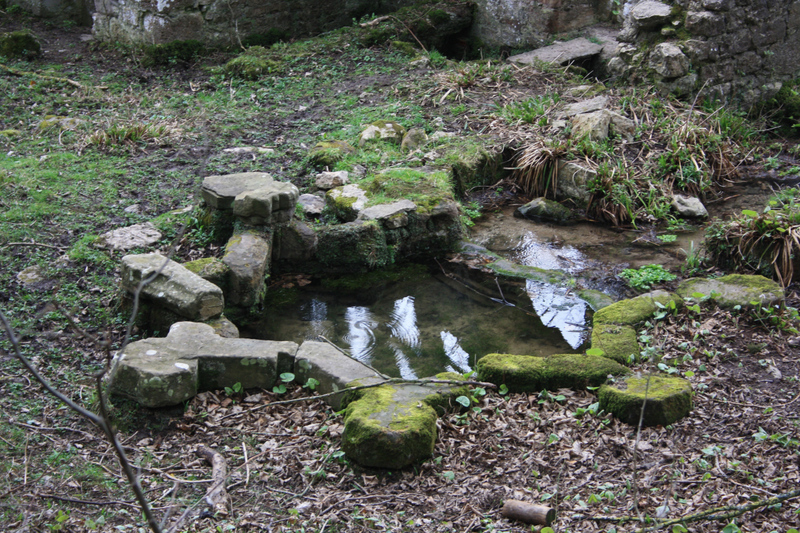 The site is of interest because of its ornate well-basin, considered to be very similar in design and age to the well-chamber at St Winifred’s Well, Holywell, which was linked to St Mary’s on the main pilgrims route across north Wales and, like that famous well – St Mary’s (Ffynnon Fair) was renowned for its healing properties. And, like St Winifred’s Well – St Mary’s does have “very cold water”. The well and its associated ruined chapel are located on private land beneath some trees, close to the river Elwy in the hamlet of Wigfair, Cefn Meiriadog parish, Denbighshire, a mile or so to the north-west of Trefnant. It is difficult to reach but from the A525 make for the bridge over Afon Elwy, then go left into the lane. A footpath runs close to the site, but access is ‘not good’ from the gate! Go across the fields and into the valley just to the north of the river to reach the well site in Chapel Wood which is, sadly, becoming ‘very’ overgrown and forgotten. The well chapel (Capel Ffynnon) was built in the 13th century, or it was rebuilt in 1500 along with the octagonal, star-shaped well-basin and attached cistern (bath); the rest of the building consists of a chancel, of a later date, a north and south transept, while the holy well stands at the far-western side of the chapel. Water from the well flows along a channel in the south transept, before meandering down to the river – Paul Davis ‘Sacred Springs’. Davis thinks the well-basin had some form of elaborate vaulting over it, probably contained within a projecting wing, and so the building originally had a cruciform plan. Could the chapel have been in use at some stage as a religious hostel for pilgrims visiting the holy well – and paying homage to Our Lady at the same time. Unfortunately, the chapel is now in a very ruinous state, leaving the star-shaped well open to the elements. Some of the 15th century Perpendicular windows retain their splendid decorative work, as do the doorways. Water in this holy well was known to cure infertility and eye disorders, according to Audrey Doughty in her book ‘Spas And Springs Of Wales’. As this well-basin looks broadly similar to that at St Winifred’s Well, in Flintshire, and given the size of the chapel could it be that the benefactor was the saintly Lady Margaret Beaufort, Countess of Richmond and mother of King Henry VII (1443-1509) – almost certainly she would have had the money to build something on such a grand scale. Audrey Doughty says the well structure is 8ft (2.4m) square; she also says that it “had without doubt been in use for very many centuries before it is said to have been rebuilt”. St Mary’s well would have been visited by Roman Catholic pilgrims and probably Protestant pilgrims as well up until the late 17th century, when the well and chapel fell into disrepair, although the well may have continued to be in use. Apparently, it is said, that up to 1640 marriages were performed here, but whether these were legal or illegal is uncertain, though a priest could ‘be payed’ to come and perform the marriage ceremony if required! Francis Jones in his acclaimed work ‘The Holy Wells Of Wales’ says of the well: “it flowed within a small well-chapel now in ruins”, and goes on to say that: “it was ruined in Lhuyd’s time who says that the ‘gwyl’ of Mary was held there”. Jones is, of course, referring to Edward Lhuyd, the 17th century English antiquarian who visited north Wales towards the end of the 17th century. Gerard Manley Hopkins (1844-89) the Jesuit priest and poet payed a visit and wrote a little bit of prose about it; and a poem was written about St Mary’s Well at Cefn by Mrs Felicia Hemans (1793-1835), who lived at St Asaph in the early part of her life. Davis, Paul., Sacred Springs, Blorenge Books, Abergavenny, 2003. Doughty, Audrey., Spas And Springs Of Wales, Gwasg Carreg Gwalch, Llanrwst, Wales, 2001. Categories: Ancient Churches / Chapels, Holy Well | Tags: Ffynnon Fair at Cefn in north Wales, St Mary's Well at Cefn Meiriadog in Denbighshire | Permalink.